THE Oly-Whites' hopes of progressing to the quarter finals of the men's Olympic soccer tournament have been dealt a huge blow after they could only manage a 1-1 draw against Egypt at Old Trafford. Chris Wood opened the Oly-Whites' account in the 17th minute with a finish at the far post after a corner kick from Michael McGlinchey was passed on by Tommy Smith. However, just before halftime Egypt's Mohamed Salah equalised to set up a tense but free-flowing second half in which both sides had great opportunities to score. 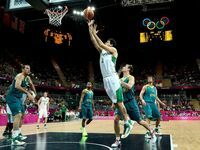 The Oly-Whites now need to beat Brazil in their final match of the competition to secure a spot in the quarter finals.